Apart from the previously mentioned Old City, Jerusalem has a lot more to offer. As Jerusalem is a big city, rich with history and numerous sights, I will only single out those that we managed to visit during our 3-night stay. Other notable sights include the Israel Museum, Mount of Olives, Mount Zion, Montefiore Windmill, etc. The most famous and the largest marketplace or “Shuk” in Jerusalem, the Mahane Yehuda Market is popular with both locals and tourists. Here you can find fresh and relatively affordable fruit, veggies, nuts, spices, cheeses, all sorts of local delicacies, drinks and other merchandise. What’s fascinating about Mahane Yehuda is that, unlike your everyday “shuk”, it is also a popular nightlife spot (especially on Thursdays). After the vendors close their stands, the place becomes filled with vibrant restaurants, bars and live music. Foodies and party people galore! 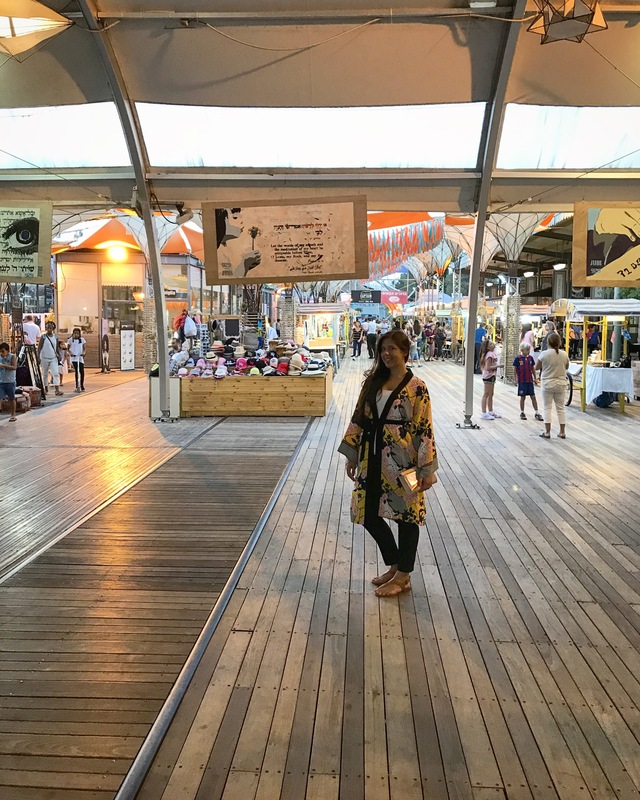 It is easily accessible with the Light Rail train (Mahane Yehuda station). The market is open from 8 AM to 7 PM Sunday through Thursday and closes at approximately 3 PM on Fridays. Despite the fact that the shops and stalls are closed on Shabbat, several cafes and restaurants remain open. Due to time limitations we had to choose between visiting the Israel Museum or Yad Vashem; we opted for the latter. The second-most-visited Israeli tourist site, Yad Vashem or The World Holocaust Remembrance Centre is Israel’s official memorial to the victims of the Holocaust and is not to be missed during your stay in Jerusalem. The museum is located on the slope of Mount Herzl (also known as the Mount of Remembrance). After getting off at the Har Herzl Light Rail station (the last station), you have to cross the street to the right and from there you can either walk downhill or wait for a free shuttle that will take you to the memorial site. The admission is completely free of charge and the opening hours are 9 AM to 5 PM Sunday through Wednesday, 9 AM to 8 PM on Thursdays and 9 AM to 2 PM on Fridays. Visiting the memorial is a deeply moving and overwhelming experience and due to the magnitude of the memorial you should reserve enough time for your visit (approx. 2 hours or more). The Jerusalem Railway Station is a historic railway station near the German Colony. Out of function since 1998, it has reopened a couple of years ago as HaTakhana HaRishona (“The First Station“), a culture and entertainment venue. Lesser known amongst tourists, it features food stalls, restaurants, pubs, stands etc. Also, many festivals have events there, so it’s basically a really cool place to eat and have fun. Transportation: David Remez/Khan bus stop 7, 8, 38, 38a, 71, 72, 74, 75. For a nice shopping experience, the shopping street of Mamilla Mall, which is the only open-air mall in Jerusalem, is not to be missed! Located just across Jaffa Gate, the mall incorporates the facades of 19th-century buildings from the original Mamilla Street and is filled with more than a hundred stores, restaurants and cafes. Bear in mind that apart from taking the train and other public transport, it is a nice experience to explore Jerusalem on foot. The main Jaffa Road as well as the nearby streets and squares are full of cafes, restaurants and street performance artists (mainly in the evenings), not to forget the colourful umbrellas in the Yo’el Moshe Salomon Street. If you are up for it, you can even walk all the way from Jaffa Gate to the Mahane Yehuda Market.